How many Logs of Wood did you Burned? How many Nights did you Sleep with a Chill? How many times did you tell Yourself this Would Be The Last Time? How many different types of Garment did you buy to hide yourself? How many times did you Climb those Mountains looking for a Sheep? 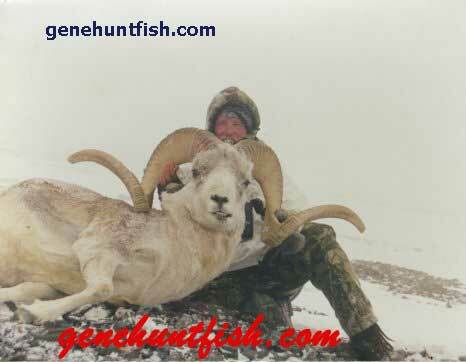 I have hunted sheep in Alberta for over 25 years, and have been in situations,that I thought I would not make it out alive. 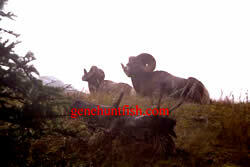 I don’t know why, but almost on every sheep hunt, something always happen. 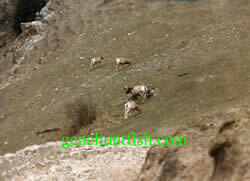 Good or bad, exciting or painful, straight up or heading straight down, this seemed to be the life, of a "Sheep Hunter". Never knowing what was on the other side of the peak or what the weather was going to do, or how you would get, little bit further. 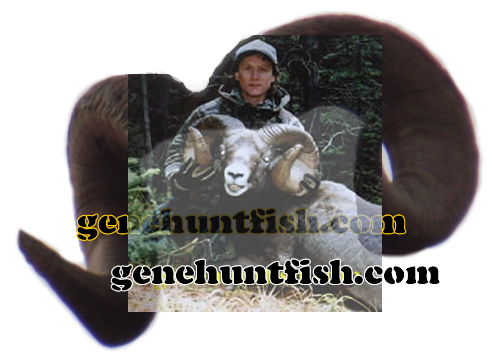 With a pack containing gear and personal effects, a Sheep Hunter has just entered a life, that is full of adventure and a lifetime of memories, that cannot be planned or prevented, unless you stay home and read someone else’s, "Sheep Hunting Stories". Why would anyone in their right mind want to beat up their body and soul, to hunt a Big Game Animal, that lives on the edge of a mountain? Why would anyone in their right mind want to sleep on a Mountain, without any protection from the elements of mother nature? It has to be the challenge to over come all odds and statistics, that others either gave up or failed. I know that anyone can go on the hunt, but are you in good shape and full of piss and vinegar? 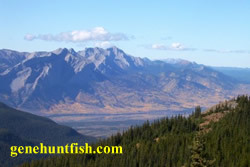 If so, you will definitely have an advantage over your fellow "Hunter or Huntress". 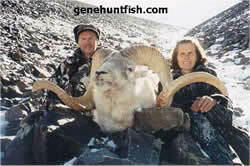 It never seems to amaze me how other hunters pack their gear when going on a sheep hunt. Stuff full of canned food, six or seven pairs of pants, jars of nuts or candy, three or four pairs of socks, radios, gadgets, alcohol, and very little or no water at all. When you run into a sheep hunter, and the first thing he or she asked you, is, do you have anything to drink or a cigarette? 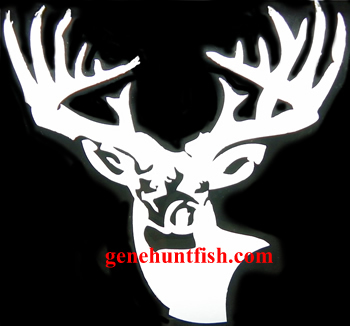 This either ticks you off or brings back memories of your first hunts on the mountain. 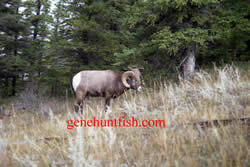 But really, how many hunters will you see or run into when out sheep hunting? To be a Smart or a Good Sheep Hunter, it takes planning, knowledge, a healthy body, and experience to have a safe and prosperous hunt. 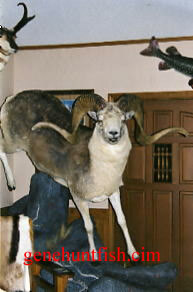 It does not take much to have a sheep hunt go wrong or bad. I can remember losing a tent on the way up a mountain, on a moonlight night, and having to go back down the mountain, looking for it. Not away to start out on a hunt. So, you better take a few more minutes prepair-ing your hunt, and then running out the door, like it was your last breath of fresh air. 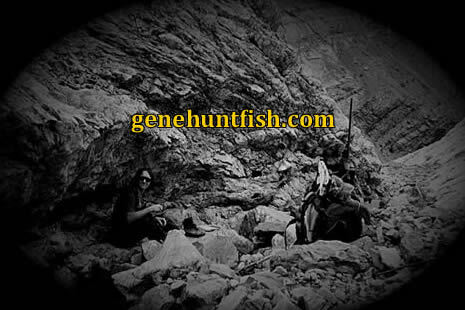 I have walked out of camp on numerous occasions leaving something behind, and it is usually something that is needed to make the hunt go smoother or better. 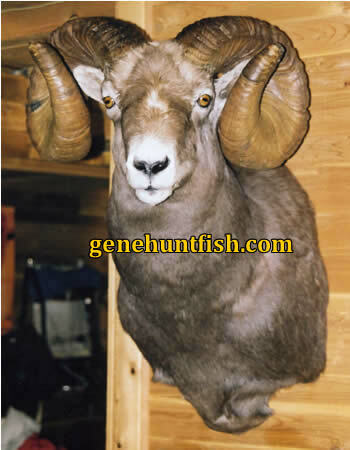 If you are going to become a Real Serious Sheep Hunter, then I would highly recommend keeping a list of all gear or stuff that you are packing and what you really need to take. Make Two Lists: one that is priority and one that is luxury. 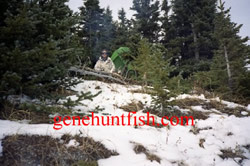 This way, you will know at all times what you are packing and what you may need to replace or repair when sitting around camp at night or when you return home from your hunt. This has saved me on many hunts and this will help any hunter become more efficient and better prepared for the next hunt. You can never take enough stuff with you, but it is very foolish to try and carry more then 50 pounds on your back, especially when climbing a mountain that is rugged and treacherous. 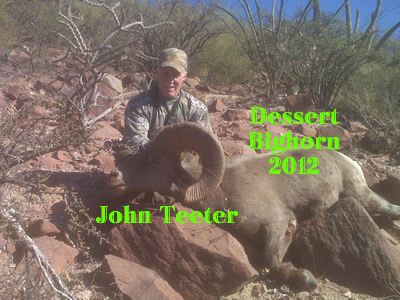 Don’t forget, if you harvest your trophy, you are going to be carrying another 60 to 90 pounds of meat, horns, and the cape or the complete hide, back down the mountain, without stumbling or falling on your head. 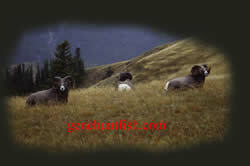 Can anyone tell me what is the most important equipment needed on a sheep hunt? If you said a "Walking Stick", then in my mind, you have chosen well. 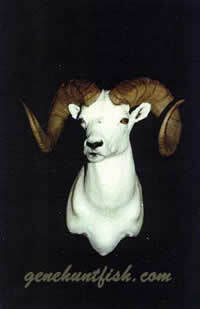 I have even made two walking sticks, to walk out with my sheep on my back. So, if you think that this is a joke! Then I know you have never had to carry your game out on your back. 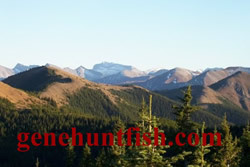 Where I hunt, a horse or a vehicle would not be able to make it in or out. That is why I enjoy this type of hunt. 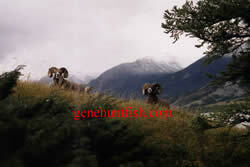 Very few hunters are willing to sacrifice their body and soul, to be a successful SHEEP HUNTER. It is always very scenic at the top and there are very few neighbors to deal with. The only thought one has to worry about is, Mother Nature and her Critters. 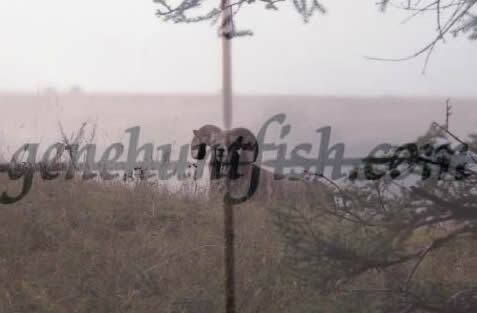 On my last sheep hunt, I had a cougar walk right up to me in my camp, while getting up out of bed. I almost fell into the fire pit and filled my pants, trying to back up towards my rifle. I am sure that the cat had the last laugh. Never let your guard down, that is the best advice I would give anyone who is on the mountain. 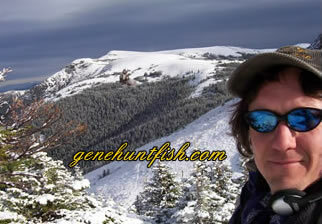 Throughout my sheep hunts, I have run into wolves, wolverines, lynx, mule deer, elk, moose, Mt. 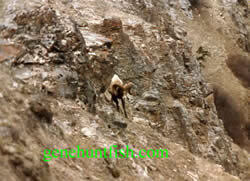 Goats, fish cops, rangers, and even hikers out climbing around. You need to be alert and you also need to keep your composure at all times. And if you don’t, you will find yourself in a scenario, that could get you hurt or worse. Never panic, no matter what the situation is, all you will do is ending up making the problem more difficult to rectify or ending up, hurting yourself. 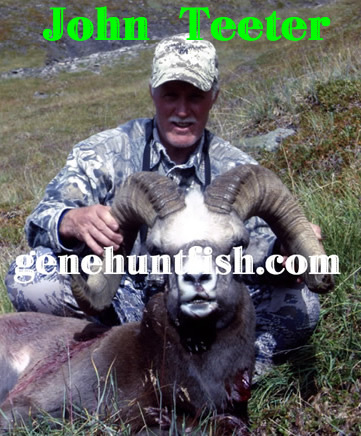 Again, with experience and plenty of hunts under your belt, you will accomplish and succeed with wonderful memories and possibly walking out, with a sheep. 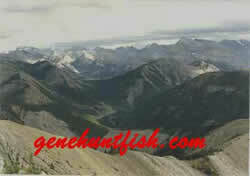 The most asked question that I have been asked, is what is the secret to walking and climbing a mountain. 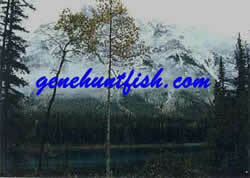 The first thing, is to be in good physical shape and train for your hunt. 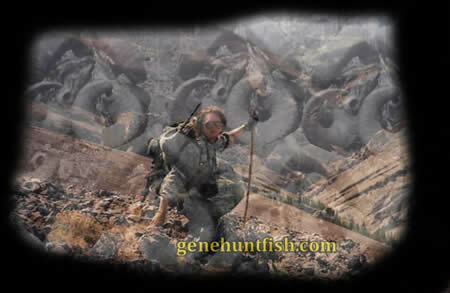 All talk and no action will be the downfall on any hunt, and I mean it. There is nothing worse then meeting up with someone that wants to go with you, and he or she is so out of shape, that all you want to say is, NO WAY! 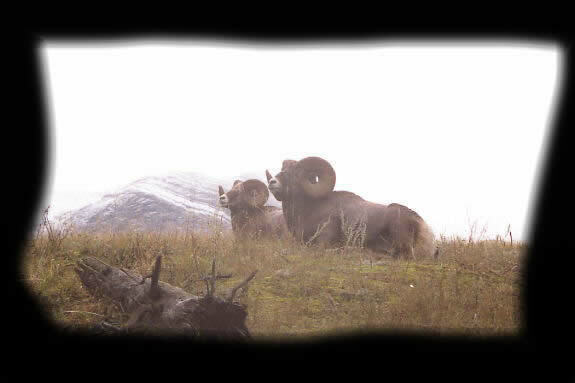 I am not sure what is going on in their heads, but I do know that I will never take anyone sheep hunting, who is not in shape and has no equipment on top. You will only end up having an altercation and ending up going home, before the hunt ever really starts. Of all the hunts to go on, a sheep hunt will put your body through the wash. Your sleeping spot maybe in a snow bank, your food maybe cold or burnt, your mind wondering all over the country with thoughts of pain, your equipment is getting yet heavier even though it is half empty, your legs shaking from the harsh environment, and worst of all, you are walking in either a snow storm or it is so hot out, that you now have finished, all your water and it is at least, 3 Thousands Feet Down to find some more water. 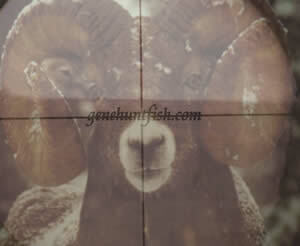 So, Now You Want To Be A Sheep Hunter? 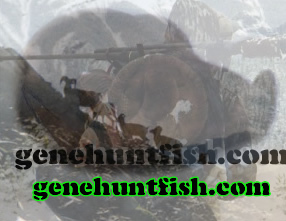 Copyright ©2001-2019 genehuntfish.com ............... All Rights Reserved.